General Electric recently released a series of commercials that repaints the 123-year-old industrial company as an innovative, fresh place to work for young computer scientists and programmers. GE’s wants to be viewed as the world’s premier digital industrial company, and Patrick Williams would like to do the same thing for agriculture. Williams works at the J.R. Simplot Company, one of the largest privately held food and agribusiness companies in the U.S. 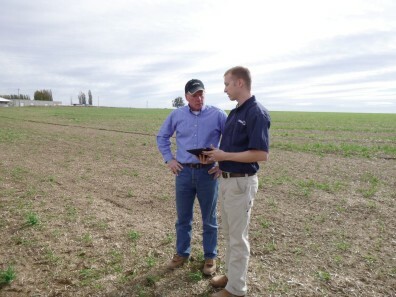 The company, established in 1929, has always been on the cutting edge of plant research and food production, with a goal of being “the finest stewards possible of the air, water, land, and other resources on which we all rely.” That mission and a program in precision agriculture are two of the main attributes that drew Williams to the company. Patrick Williams consults onion farmer. Precision agriculture focuses on improving crop yields with a more sustainable use of land, water and fertilizer. While the concept is not new, it has taken on new meaning and potential in the last decade due to advancements in robotic, satellite, and sensor technologies. Innovative farming is also becoming a more wide-spread concern amid increasing food demand and environmental constraints, and a decreasing labor force. Technology-based precision agriculture first entered the scene around the 1990s, bringing in a wave of improved farming practices including GPS-directed tractors, irrigation systems that can be turned off and on from your phone, and site-specific fertilizing. These innovations have already made a significant impact on the agriculture industry, and they only scratch the surface of possibilities. Much still needs to be done in the way of technology and workforce development to fully shift the industry into what some are calling Agriculture 3.0, and to address major needs like feeding 9 billion people by 2050. Part of that process will be attracting a new demographic to work in the agriculture industry. “You don’t have to grow up on a farm to create the next big solution for farmers,” Williams said. Williams himself did not grow up on a farm. Raised in Spokane with a “techie” father, Williams spent time taking apart and rebuilding computers. At the same time, he developed an early love for gardening and the outdoors, which evolved into a concern for preserving natural resources. Williams decided to pursue a degree in agriculture from WSU, but also hoped to find a way to tie in his technological interests. Thanks to a chance encounter with professor Jim Durfey during Williams’ college orientation, he found the perfect way to marry the two interests. Durfey launched WSU’s Agricultural Technology and Production Management program in the 1990s, when technology-driven precision agriculture had just entered the scene. Working across disciplines, the program supplements education in crop and soil sciences with introductions to farming software, equipment and machining, finance, and management skills. Students are highly encouraged to do multiple internships, so they graduate with a diverse skillset, hands-on experience, and a minor in business administration. Even though the program offers options for a wide array of interests, when Williams was a student he was the only person in the program who didn’t grow up on a farm. Durfey absolutely wants students interested in agriculture in class, but also wants technology and business minded students to see what the young man in the GE commercials saw; the opportunity to make an impact by investing his talents towards solving our most pressing global challenges. While Durfey is happy to see the growth of his ag tech program over the years, more is needed to attract a new student demographic and develop the workforce for this evolving industry. Washington’s Agriculture Center for Excellence addresses this need through competitions and outreach on high school and middle school campuses to introduce students to the possibilities of agriculture early. The Center also offers resources for students to find and prepare for agriculture job opportunities, and for industry to connect to the future workforce. Durfey and the Center’s director, Bill Griffith, still want to see more interaction with industry – more internship opportunities and perhaps even externship opportunities for professors, in order to keep students up-to-date on the knowledge and skills that the industry needs today, and will need tomorrow. This post is a mini-series on precision agriculture that WSU’s Office of Economic Development is publishing because of the Precision Farming Expo that took place in Kennewick in early January. Williams, Durfey and Griffith spoke on a panel about workforce development at the Expo.